Wind turbines dot the landscape near Odell. The Lancaster County Board approved a 1-mile distance required between homes and wind turbines Tuesday. Wind energy developers in Lancaster County will be required to place turbines at least 1 mile from any home that is not being paid to participate in the project. The mile rule, the strictest in the state, will give homeowners some comfort and protect the quality of life in rural areas, said County Commissioner Deb Schorr. The County Board approved the rule and other minor changes in the county’s wind farm rules on a 3-2 vote Tuesday morning. “This is a quality-of-life setback.” It is a protection in the mind of nearby homeowners, and will help with community buy-in, but won’t kill the project, Schorr said. “This is a stalling tactic,” said Commissioner Sean Flowerday, who joined Jennifer Brinkman in opposing the mile rule. Voting for the mile rule were Schorr, Roma Amundson and Rick Vest. Opponents to a wind farm being considered for southern Lancaster and northern Gage counties, who have organized as Prairie Wind Watchers, proposed the mile limit. An original proposal required a mile setback from any turbine to the property line of a nonparticipating property. Commissioners ultimately approved a mile setback to a dwelling. 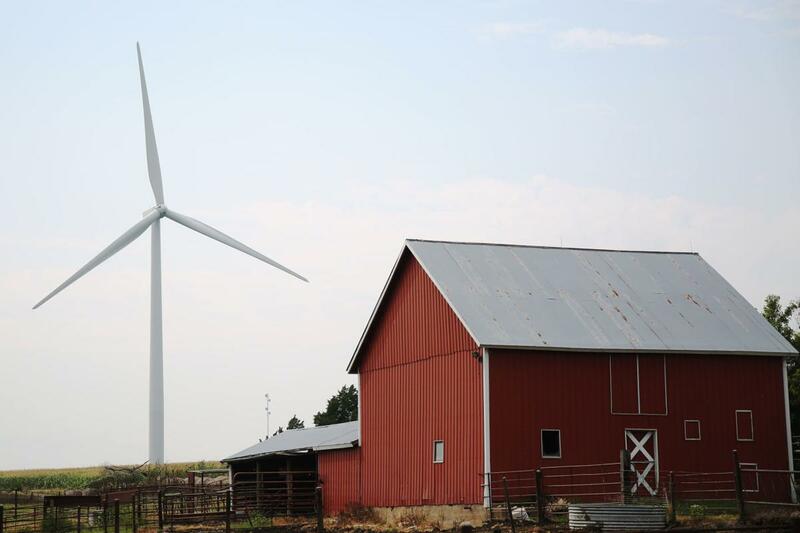 Three years ago, the county set minimum setbacks for wind turbines of 1,000 feet to a property line, with potentially longer distances depending on the height of the turbine. The previous rules also set noise limits of 40 decibels in the daytime and 37 decibels at night for nonparticipating property owners and 50 decibels both day and night for participating properties. Developers have provided studies showing that a turbine would need to be set back at least a mile in order to meet those noise standards, said Mark Hunzeker, a Lincoln attorney representing Prairie Wind Watchers. A mile standard is easy and inexpensive to enforce, he said. Enforcing noise limits after a turbine is in place is difficult, Hunzeker said. No one thinks a county board would order an expensive turbine to be removed if it violates noise regulations. At best, the wind farm would have to regulate the times of operation or speed of the turbine, he said. Supporters of the proposed wind farm pointed out the county already has a science-based noise rule that sets distance requirements. Do not add another layer of requirements that are not based in science or law, said David Levy, an Omaha attorney representing NextEra Energy, the company considering developing a wind farm in the county. A study done by NextEra that indicates a mile setback is appropriate used modeling based on one of the louder turbines that was being considered for this area, said David Kuhn, with NextEra. New technology might create less-noisy turbines that could be placed closer to homes without violating the noise rules, he said. “There is no reason to add this other requirement,” he added. A bill (LB373) in the Legislature, proposed by Sen. Tom Brewer of Gordon, would require counties to have zoning regulations if they wish to host wind energy facilities, including preventing towers within 3 miles of a residence without the property owner’s written permission. Commissioners in Lancaster County did endorse requiring a wind farm developer to do post-construction testing to ensure turbines meet noise standards, and approved some minor changes to zoning language meant to clarify intent.